Before you go out shopping, you should create a checklist and consider what your budget is for everything you need. This way, you know exactly what you are looking for and you won’t end up broke after the shopping trip. If you are starting from scratch, some things to put on your list include the following: a printer, a fax, office desk, executive chair, meeting chairs, and file storage space. Is your office more relaxed or in a corporate environment? This will help you determine what style of office furniture to buy. Is it a walk-in office or on the 27th floor of a building? This will help you prepare for the moving process for large furniture pieces. Consider furniture style that reflects the image of your company. Also take into account what size furniture you are looking for and what sort of storage space you need. Some people may just want a small work desk while others need something larger with built-in drawers to store documents. For more information please contact us today. We look forward to speaking with you. Tech companies are known for their open office floor plans, which some argue promote collaboration. However, new research suggests that productivity in these spaces may decrease because of distractions. While the open office plan may be wonderful for individuals who thrive in a more collaborative setting, others need a quiet place to work. Cubicles offer one solution to the problems with open work spaces. They give workers more personal space than open office plans and allow for some individuality because employees can add personal touches to their work spaces, like family photos or plants. The Harvard Business Review reports people highly value visual and sound privacy in their work spaces, so employers may wish to consider the levels of privacy provided by their office design. Because of the partitions, cubicles allow people to work in a more visually private space and have conversations with clients or co-workers without worrying that everyone in the office will hear them. Many executives see cubicles as expensive, not only because the item itself must be purchased, but also because more workers will fit in less space if they are at long tables or desks without walls between them, meaning business can lease smaller and cheaper spaces. However, purchasing refurbished cubicles significantly reduces the upfront cost, and greater productivity and increased employee satisfaction can quickly make up for the cost of renting slightly more square feet. The right office furniture and layout can make your work space more attractive as well as promote productivity and employee happiness! If you are looking for cubicles for your employees, contact us. Does Your Office Still Need Filing Cabinets? While many offices are almost paperless these days, most offices still need a place for paper back-up copies of important papers. 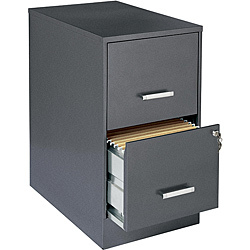 Filing cabinets continue to play a role in an efficient office. But maybe there’s a better way than acres of filing cabinets using up wall space and costly square feet in your business. Here are some things to consider when updating your office space. Your old cabinets may be outdated, damaged, inefficient or a hodge- podge of colors, sizes and styles. Consider the many new filing cabinets and filing systems that are available from the Office Planning Group. A new layout of office space, including file cabinets, desks or cubicles may help you avoid the necessity of moving to larger facilities, along with the higher rent that would entail. If your need for filing cabinets is limited to filing space for back-up material and occasional use by only a few people, group them all together in a single room or at one end of your office. Lateral files come in various heights and can be placed in narrow rooms, or even hallways, if necessary, while traditional vertical cabinets can be grouped together to provide greater storage along the same linear wall space. Your office space must look up-to-date if you regularly have clients or other visitors coming through your facility. But even if no one other than your employees sees your space, you shouldn’t underestimate the value of an updated facility on the morale and productivity of your employees. File cabinets that are all the same color, size and shape, purchased at the same time, go a long way toward emphasizing and reinforcing the professional appearance of your office, and the competency of your staff. Our space planning staff will be glad to consult with you and develop the best products for your needs whether you are refurbishing your current office or moving to larger or more efficient space. We have the professionals who can design, source and deliver the best products for your business needs. Your investment in proper, well-designed filing cabinets and other office furniture will impress your clients and help you gain, and then keep, their business. Contact us today to begin the process of redesigning your offices and creating the work spaces you need to impress clients and your hard-working employees. Remanufactured Vs. Used Cubicles: What’s the Difference? Are you thinking of buying some new office cubicles, but the cost is enough to make you change your mind? Consider buying remanufactured or used office cubicles instead. Remanufactured office cubicles were originally used, but they have been stripped of their old looking surfaces, and refurbished with custom new ones. Remanufactured Office Cubicles are more expensive than used cubicles, but they provide much more customization and flexibility. Companies that specialize in refurbishing used furniture usually build the cubicles on an as needed basis, customized by the purchaser.By companies piecing out old used cubicles in order to make “like new” ones, the customer is able to personally build the cubicle in the way that they want – Not just stuck choosing from what is left in stock. This is why remanufactured cubicles have caught on over purchasing used, discount “as is” office cubicles from a clearance house. Choosing remanufactured, used office cubicles, allow the consumer much more choices and financial leeway in the design process, especially when one is redecorating an old office space. Remanufactured cubicles offer fully customized configurations that used cubicles cannot, such as fabric colors, and laminate choices, making it hard to tell the difference between an expensive new cubicle and a cost effective refurbished one. Green furniture is still the #1 office trend of 2015, with the nation’s environmental concerns trending into mainstream, and awareness over deforestation and the impacts of climate change leading to consumers demanding more “Green” office furniture. Remanufacturing companies rightfully point out that re-using and refurbishing old office cubicles is not only better for the environment by reducing landfill waste, but it creates jobs, and is easier on the consumer’s pocketbook as well. Remanufactured office cubicles are made using an environmentally friendly process, in which they take all the used pieces and then strips them down; recycling any reusable materials, repairing, reupholstering, and repainting the core components, thus reducing the nation’s carbon office imprint on the planet. Volatile organic compounds (VOC) are byproducts of the manufacturing process in the making of new office cubicles. These VOC’s go straight up into the atmosphere endangering all of us. Remanufacturing used office cubicles reduces the amount of toxic VOC’s that are released into the Earth’s atmosphere: Helping to fight global warming, acid rain, and other devastating effects of air pollution. A major plus to going remanufactured, is that it can help your company achieve LEED certification from the United States Green Building Council. This certification is a great marketing tool in today’s green friendly environment. 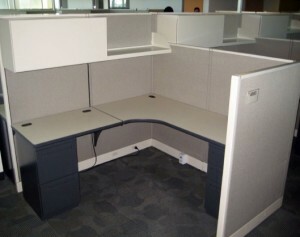 Used Office Cubicles are just that, pre-owned and sold in an as-is condition. They may be cheaper than both new and refurbished office cubicles, but can defeat the purpose of redecorating, and/or, can just make a new office space look old. 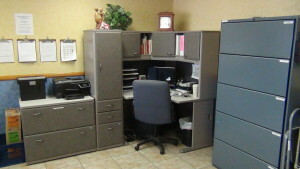 Used cubicles are normally made available due to company moves, bankruptcies, or office building remodels. Furniture liquidation companies will usually buy these in lots, clean them up, and then re-sell them. One of the benefits of buying used office cubicles is that with over a decade of office closures due to the past great recession, it is still a buyers’ market for used office furniture, some even barely used. This can be a much cheaper route to take than buying new or remanufactured. 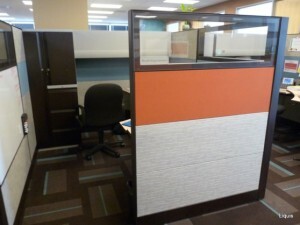 Companies often buy used office cubicles for value and quality at bargain prices. Due to the fact that new cubicles lose value daily in depreciation and normal wear and tear, this is why so many companies prefer to explore the used option first. Sometimes discount stores sell new furniture at very low prices, but the quality of their merchandise is dubious at best. These types of places are usually fly-by-night and shouldn’t be trusted. Just like when buying a used car, with used “certified pre-owned” cubicles, the consumer should always use a cautious buyer beware mentality when considering used office cubicles. When buying used from a reputable dealer, one can scoop up some great deals on used upper-end cubicles made by companies such as Genesis, HON, Mirage, Maxon, and Packard, rather than cheap knockoffs. What are the price differences between used and remanufactured office cubicles? Most companies that sell used office cubicles claim that they can save you 70 to 80 percent on buying used instead of new at retail. Remanufactured cubicle prices can vary due to the customized dimensions of the cubicle, the types of finishes and fabrics used, and whether the cubicle comes with extra features such as cabinets, bookshelves, and task lights. Used or remanufactured cubicles offer a considerable savings over new cubicles. According to CostOwl.com, one can expect to spend $300 to $800 per cubicle for used or remanufactured ones, rather than from $1,000 to $3,000 if they purchased them new.Remanufactured cubicles will cost a little more than used cubicles sold “as is,” depending on the materials that were used in refurbishing them, but unlike most used cubicles, they will look like they are brand new. One thing that has been clarified about Remanufactured vs. Used Cubicles is that the benefits of buying either of the above stated cubicles far outweigh the benefits of simply buying new and costly ones. Before even getting into the economic reasons why one should buy used or refurbished, instead of new, let us list the environmental benefits of used and remanufactured first. Deforestation, air pollution, overcapacity landfills, global warming, these are all unavoidable bi-products of manufacturing or buying new office cubicles rather than recycling them. It just makes good green business sense to consider easing these burdens on the Earth caused by over manufacturing, by simply responsibly choosing the remanufacturing of readily available used office materials instead. Saving more than two thirds off by purchasing used or remanufactured office cubicles, is an obvious added business plus, along with good public relations, and good old fashioned cost effective purchasing. In an overly competitive 2015 business world where “Cash is King” – Going office “Green” by going Used or Remanufactured, adds another jewel to the company crown. Creating a space where your staff and visitors can feel comfortable, confident and engaged is one the most important things a business needs to consider. It’s great having the room, but if you are not using it effectively and maximizing the potential you could be losing out on a number of levels. Are your staff too cramped or too spaced out? Do they have the equipment they need to do their jobs properly? How does the office look to potential customers who walk through the front door? Does your office space have the kind of X-factor that is designed to impress? There are lot of questions that need to be answered honestly if you are looking to make the most of your office. Whilst a lot is made of the technology that we now use in our offices, from desktop pcs and smartphones to all singing and dancing multi-function printers, if you want a workplace that makes a difference to the way you think and feel, it pays to take a closer look at the furniture you have. The humble desk is one of the more important parts of any office environment but it is quite often the most neglected when it comes to selection. Inexperienced managers can get things wrong by ordering a series of uniform desks based on the number of people who need them. Modern desks are available in a broad range nowadays and it might be better for releasing up valuable space if you take advice on what fits best with what. Tables don’t have to be square. They can be round, hexagonal, triangular or even jigsaw shaped. 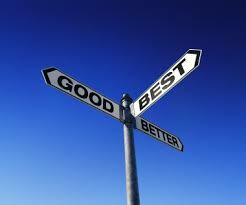 You also need to take into account the working practices of your staff. If you want to introduce a more vibrant atmosphere you might select some standing desks which are designed to give employees a gentle work out rather than being slouched in a chair all day. Giving your staff different desks to work at depending on how they feel that day is a great way for fostering employee engagement. Another thing to consider is whether your staff need drawers and cupboards or would prefer just a basic desk design. Having a good think and shopping around can ensure that you come up with the right desks for your needs and you may well find a few interesting designs that help you save on valuable space. Buying low cost chairs for your staff can seem like a great way to save on your furniture budget but it can also backfire if you want to get the best out of them. An uncomfortable or unsupportive office chair can make an employee get up more often and can even, over a long period, cause them postural damage that could lead to time off work. Lower cost office chairs also don’t last as long and are generally a false economy. Paying a little more and getting an office chair that provides support is the better way to go if you want to get a suitable return on investment for your office furniture. No office furniture provision would be complete without the cabinets and cupboards in which to store those important documents, printer consumables and odds and ends that you may need at some time during the working week. There are more ingenious storage possibilities available to anyone looking to arrange the office furniture. From slim cupboards to cabinets that open on several sides, you can generally find any size cabinet or cupboard to fit the right space and give you more room. While open plan is ever more popular, the majority of employees prefer some kind of cover whilst they are working at their desk. This can be from desktop privacy screens or floor screens that separate different sections of the office. The great thing about cubicles is that you can use them to redesign and define your office space, making it look more professional when visitors arrive. One of the places where most businesses like to create an impression is the reception area. Whether you have clients visiting for an update or someone attending an interview, it is a good idea to make your reception as attractive, business-like and as welcoming as possible. You can make it look more efficient with a suitable desk for the receptionist, place attractive artwork on the walls and add a few plants, but don’t forget to install seating that is slightly more luxurious than perhaps the rest of your office. Most industries have their manuals and documentation that needs to be easily accessed. Putting in a bookcase means that you have one certain place where people can go for the information they need. From small two or three shelf bookcases to ones that can be fixed across a whole wall, a strategically placed amount of shelving will make an attractive and useful addition to the office. Most businesses nowadays, if they can afford the space, have somewhere staff can go and relax whilst they are not working. This is often a kitchen area where people congregate, eat their lunches, have a coffee or go for a quiet chat. Installing some furniture in this space, that is both comfortable and inviting, makes employees feel they are appreciated. Choosing the right breakout furniture can help nurture staff relationships and make for a much happier workplace. Getting the right furniture for your office can be a nightmare if you don’t have a plan. Often businesses just add pieces here and there as they go along which means that the office doesn’t have much of an identity and sometimes no real structure at all. Rather than moving straight ahead with your refurbishment and ordering without thought, it is a great idea to sit back and consider all the options first. Making the right choices will make a big difference on the way your staff and clients feel and how your business operates. A little thought and a bit of consultation can help you put together an office furnishing strategy that counts and will benefit everyone for several years to come.